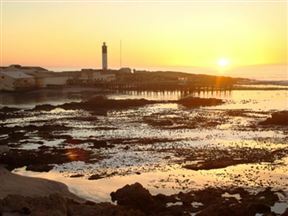 This quaint little bay boasts a beautiful lighthouse and a crayfish factory that sup[ports most of the town's folk. Doringbaai offers beautiful, scenic views, and a rich ecosystem great for avid birders and nature lovers. Doringbaai Beach is 0.5km from the centre of Doringbaai , the nearest airport 242.4km (Cape Town International Airport).